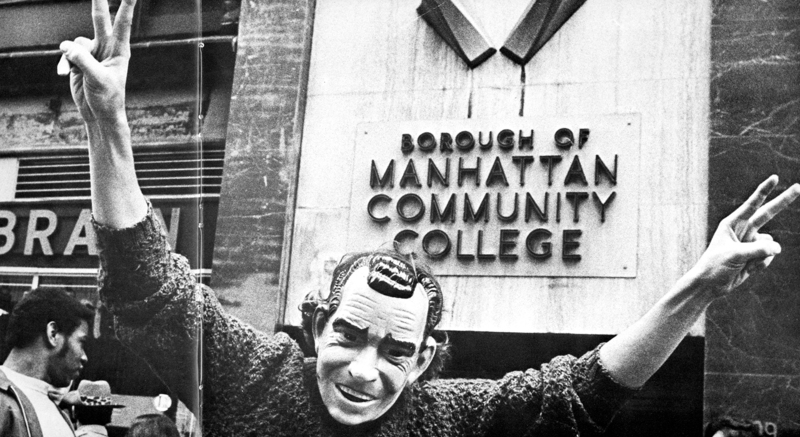 Printed in the BMCC 1971 yearbook, Prism, this photograph shows a BMCC student wearing a plastic President Nixon mask in front of BMCC's "B-bldg" at the height of the 1970's protests. Students demands included an end to student fees and a day care center for thier families as well as national issues related to the war in Vietnam. Cite This document | Curtis, John, Landsman, Robert, and Lee, James, “Student wearing Nixon Mask,” CUNY Digital History Archive, accessed April 24, 2019, http://cdha.cuny.edu/items/show/3052.